The Inn of the Sixth Happiness is a 1958 DeLuxe Color 20th Century Fox CinemaScope film based on the true story of Gladys Aylward, a tenacious British maid, who became a missionary in China during the tumultuous years leading up to the Second World War. Directed by Mark Robson, who received a nomination for the Academy Award for Best Director, the film stars Ingrid Bergman as Aylward and Curt Jürgens as her love interest, Captain Lin Nan, a Chinese officer with a Dutch father. Robert Donat, who played the mandarin of the town in which Aylward lived, died before the film was released. The musical score was composed and conducted by Malcolm Arnold. The cinematography was by Freddie Young. The film was shot in Snowdonia, North Wales. Most of the children in the film were ethnic Chinese children from Liverpool, home to one of the oldest Chinese communities in Europe. Once in China, she settles in the town of Yang Cheng, where she secures a post as assistant to a veteran missionary, Jeannie Lawson (Athene Seyler). Lawson has set up an inn for travelling merchants, where they can get a hot meal and hear stories from the Bible. The film follows Aylward's acculturation, culminating in her taking over the inn when Lawson dies in an accident. The local Mandarin (Robert Donat) appoints Aylward, a stubborn but endearing woman, as his Foot Inspector to ensure that the ancient practice of foot binding is eradicated in the region he governs. She succeeds in this, and manages to put down a prison revolt as well, winning her the esteem of the local population and of the Mandarin. Meanwhile, however, China is being invaded by Japan, and Aylward is encouraged by Lin (Curt Jürgens) to leave. She refuses, and as the town of Yang Cheng comes under attack, she finds that she has fifty orphans in her care. As the population prepares to evacuate the town, the Mandarin announces that he is converting to Christianity to honour Aylward and her work. She is now left alone with the children, aided by Li (Burt Kwouk), the former leader of the prison revolt she helped to resolve. Lin tells her that the only hope for safety is to take the children to the next province, where trucks will evacuate them to a safer area, but they must get there within three weeks, or the trucks will leave without them. Just as they are preparing to leave, another fifty orphans appear from a neighbouring town, so Aylward and Li have no choice but to lead one hundred children on a trek across the countryside. Although it should only have taken them a week, the roads are infested with Japanese patrols, and the group has to cut across the mountains. After a long, difficult journey, they all arrive safely (except for Li, who died to save them from a Japanese patrol) on the day the trucks are to leave. Aylward is greeted by Dr. Robinson, and she reminds him of how he rejected her as a missionary years before. The film culminates with the column of children, led by Aylward, marching into the town, singing the song "This Old Man" to keep up their spirits. Shooting the film in Wales. 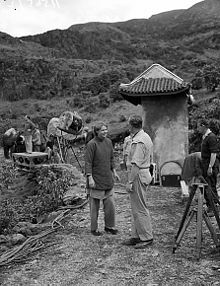 For the production of The Inn of the Sixth Happiness 20th Century Fox rented space at MGM British Studios Borehamwood, where the Chinese villages were built on the backlot, with location scenes filmed in Nantmor, near Beddgelert in North Wales. A gold-painted statue of Buddha that was used on a set for the film is now located in the Italianate village of Portmeirion, North Wales. Sean Connery was considered for the role of Captain Lin. His screen test can be seen on the DVD. Since the film's release, the filmmakers have been criticised for casting Ingrid Bergman, a tall woman with a Swedish accent, as Gladys Aylward, who was in fact short and had a cockney accent. Likewise, the two male leads, British actor Robert Donat and Austrian actor Curt Jurgens were not even Chinese (though Jurgens' character is said to be half-Dutch). Singer Bill Elliott sang the hit song "The Inn of the Sixth Happiness" with the Cyril Stapleton Orchestra. The film was based on the biography The Small Woman (1957) by Alan Burgess. In 1958, the year of the film's release, she founded a children's home in Taiwan, which she continued to run until her death. Known in China as 真爱 (Zhēn'ài or Jen Ai) meaning true love or "the one who loves people" as she has grown to love the people dearly. She continues to be regarded as a national hero. Gladys Aylward was deeply upset by the inaccuracy of the film. Although she found herself a figure of international interest thanks to the popularity of the film and television and media interviews, Aylward was mortified by her depiction in the film and the many liberties it took. The tall, Swedish Ingrid Bergman was inconsistent with Aylward's small stature, dark hair and cockney accent. The struggles of Aylward and her family to affect her initial trip to China were skipped over in favour of the plot device of her employer "condescending to write to 'his old friend' Jeannie Lawson", and Aylward's dangerous, complicated travels across Russia and China were reduced to "a few rude soldiers", after which "Hollywood's train delivered her neatly to Tsientsin." The names of many characters and places were changed, even when the names had significant meanings, such as those of Aylward's adopted children and of her inn, named for the Chinese belief in the number eight as an auspicious number. Captain Lin Nan was portrayed as half-European, a change which Aylward found insulting to his Chinese lineage. She also felt her reputation damaged by the Hollywood-embellished love scenes in the film; not only had she never kissed any man, but also the film's ending portrayed her character abandoning the orphans in order to join the captain elsewhere, even though in reality she did not retire from working with orphans until she was 60 years old. In real life, Aylward and Lin Nan were not reunited—he was lost in the war and she never knew what happened to him. The film was the second most popular film at the British box office in 1959. ^ "China Town - Liverpool". CITY PORTAL LIVERPOOL. 28 September 2009. Archived from the original on 12 October 2006. ^ Munck, Ronaldo (2003). "Ethnic Minority Perspectives". Reinventing the City? : Liverpool in Comparative Perspective. Liverpool University Press. p. 132. ISBN 0-85323-807-3. ^ Sam Wellman. Gladys Aylward: Missionary to China, Barbour Publishing Inc., 1998, page 197. ^ "Year Of Profitable British Films." Times [London, England] 1 Jan. 1960: 13. The Times Digital Archive. Web. 11 July 2012. ^ "AFI's 100 Years...100 Heroes & Villains Nominees" (PDF). Retrieved 14 August 2016. ^ "AFI's 100 Years of Film Scores Nominees" (PDF). Retrieved 14 August 2016. ^ "AFI's 100 Years...100 Cheers Nominees" (PDF). Retrieved 14 August 2016. This page was last edited on 14 March 2019, at 05:54 (UTC).